Starting out in 2013 Singapore based Gruppo Gamma has made some pretty cool vintage inspired watches. Gruppo Gamma currently has three models: The Chronnaut, the Vanguard, and the Divemaster (which I reviewed here). Today, we’re looking at the Gruppo Gamma Vanguard, which takes inspiration from the Rolex 6152 that was made for Panerai. The Gruppo Gamma Vanguard is what the brand feels that 6152 case could have evolved into. The original Rolex 6152 had a smooth cushion style case – aka the “Panerai case”. Instead of keeping that smooth look, Gruppo Gamma decided to make this cushion case a bit more blocky and added bolt-on crown guards. This look gives the watch a tougher look and I like what I see. 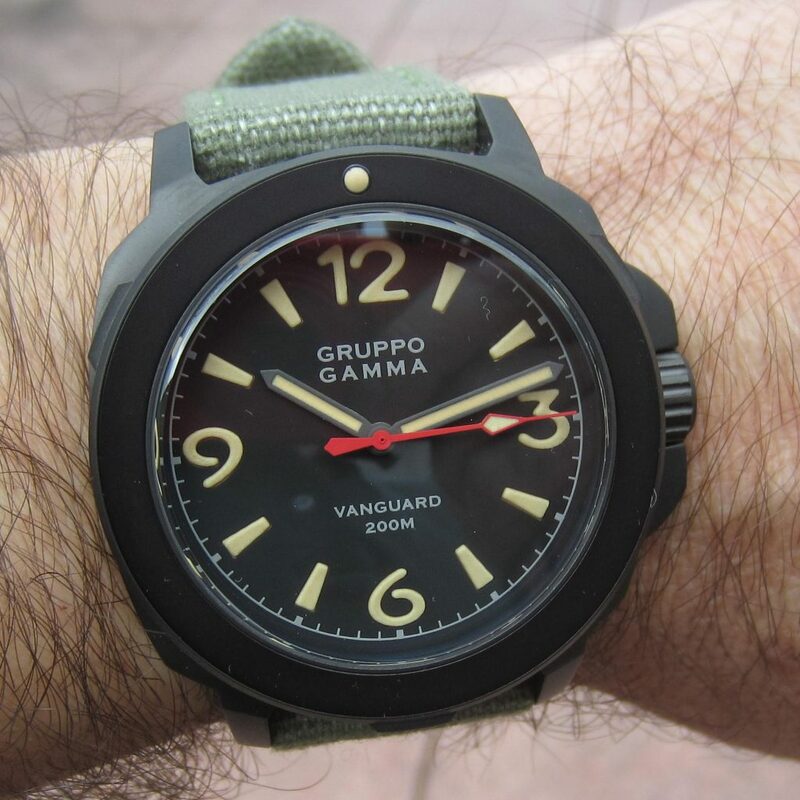 For our hands-on review, we were loaned a Gruppo Gamma Vanguard A-04D. Let’s take a look at this tough guy, shall we? The Vanguard is a 3-hander with no date. The sandwich dial, numbers, and hour markers are filled with vintage colored Swiss Superluminova. The hour and minute hands are gunmetal color and also filled with vintage-colored Swiss Superluminova. The second hand stands out with its red paint against all that black. Protecting the dial is a double domed anti-reflective treated sapphire crystal. Made from solid stainless steel and PVD treated in gunmetal grey (almost black) this 42mm case is tough-looking and looks ready for action. The crown is screw-down and protected by large bolt-on guards. The caseback is stainless steel (screw-down) with an sapphire crystal to show the automatic movement. The 120-click unidirectional bezel is simple as can be, with only one marker to mark the time (start or end, your choice). Since this is not a diver, you don’t need to be down the minute; this cleaner style just looks good to me. Also worth noting is that the movement of the Gruppo Gamma Vanguard bezel is tight, with no noticeable play. The Gruppo Gamma Vanguard is powered by a reliable Seiko NH35A automatic movement. One change from your standard, off-the-shelf movement, is the use of a signed and decorated (Côtes de Genève) rotor. When you buy the Gruppo Gamma Vanguard you get two straps. The main strap that comes on the watch is an olive green canvas strap that goes well with the military looks of this watch. However, if you want to dress it up a bit you can use the tan leather strap that is also included. The straps can easily be changed by using the included screwdriver. There is no extra buckle, so you will need to move that between the straps. The canvas strap is stiff, with a tight knit, but it is not uncomfortable. Likewise, the leather strap is soft and comfortable. For my tastes, I really like the whole military field thing so I thing I would just stick with that canvas strap, but it is nice to have choices. The Gruppo Gamma Vanguard is well-built and very solid. Frankly, it is a no nonsense watch where the only colorful design feature is that red second hand. It makes me want to say that my watch can beat up your watch. I felt like I should be out there firing a cannon, training for some mission, or just some type of adventure. With a reliable Seiko movement, sturdy case, sapphire crystals, and strong lume, this is a good watch to add to your collection. Gruppo Gamma is currently taking pre-orders and will have them available by April. The pre-order price is $419; regular retail will be $550. gruppogammawatches.com. The best thing about it: Its tough military look. Measurements: 42mm wide, 50mm lug to lug, and 14mm thick.